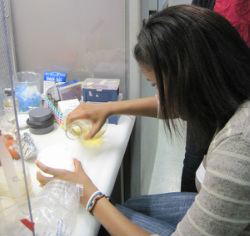 Our lab is interested in studying adaption in natural environments using the fruit fly, Drosophila melanogaster. We collect flies from natural populations in orchards along the east coast of the United States to better understand climatic adaption. For Science Day we demonstrated the steps involved with our research, beginning outside with collecting fruit flies. We then brought the flies back into the lab and looked at them up close under the microscope. Next we tested flies from the north and south to see which had higher ethanol tolerance. This is an important ecological response for fruit flies because they live on rotting fermenting fruit can contain up to 18% ethanol. The students were able to show that the flies from the south are more ethanol tolerant than the northern flies. In the Linksvayer lab we explored the diversity and complexity of eusosical insects. 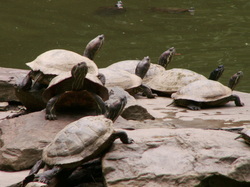 Eusocial organisms are characterized by cooperative brood care, generation overlap and reproductive division of labour. Traits associated with eusociality are most developed in ants, termites, wasps and bees. All of these insects can be found in parks and gardens here in Philadelphia. 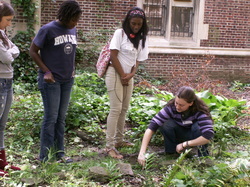 Students discovered the natural habitats and nesting sites of eusocial insects colonies and collected specimens from the UPenn Biopond. 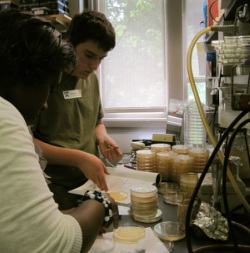 Insects were brought back to lab and students identified reproductive castes under the microscope. Students learned that males and queens in eusocial colonies are fertile and able to reproduce, while workers are females that forage and can be completely sterile, contributing no eggs to the colony. Reproductive division of labour is unusual in other animals, but common among insect societies and has lead to their foraging efficiency, group productivity and remarkable ecological success. 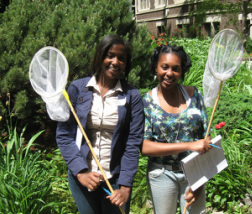 Our experiment introduced students to the fascinating science surrounding insect pollination. 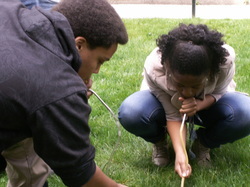 To begin, students performed pollinator observations in the Penn BioPond garden, watching for which insects pollinated which plants. 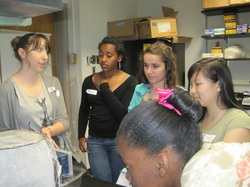 After some brief discussion, they brought some select flowers and insects into the lab to look at under the microscope. Using a special technique, students could distinguish if flowers had been pollinated or if insects had been pollinating flowers. We all know that organisms are arranged into groups called "species", but most people don't know the strict rules by which species are named or the guidelines under which we group them. In this exercise students received some background knowledge on the International Code of Zoological Nomenclature (ICZN) that is in essence the rule book for creating species names. They were then asked to decide whether different populations of snails belonged to the same or separate species based on morphological and chromosomal evidence using one of three provided suggested species concepts. They were then asked to name their species according to ICZN standards. We used chemical signaling in insects to demonstrate the scientific method. First the students worked with termites which use chemical signaling via chemical trails to communicate with each other (intraspecific signals). They made observations about the behavior of the termites alone, and then designed experiments to determine how termites follow a trail using a variety of chemical and visual cues. The students worked with mosquitoes which sense chemicals from other species (interspecific signals) in order to find an animal for bloodfeeding. For these experiments the behavior of the mosquitoes was observed in the presence/absence of outside chemical cues, namely CO2, a chemical found in the breath. For each study system the students first learned some background information and were encouraged to discuss research questions and develop testable hypotheses. 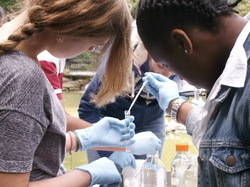 The objective of this activity for the students was to test and compare the water quality of fresh water sources which included water from a pond, river and tap water. 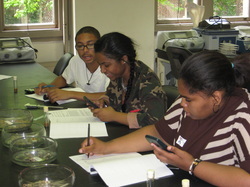 The students measured the pH levels, phosphate and nitrogen content, the amount of dissolved oxygen, level of turbidity and tested for the presence of coliform bacteria in the water samples. Based on the provided chart for optimum levels, students learned how nutrients like nitrogen, ammonia, dissolved oxygen and pH need to be balanced within a fresh water ecosystem for it to be classified a healthy water source. In addition, we observed slides under the microscope of living organisms that inhabit a natural pond environment and discussed that many of them are also indicators of healthy ponds. Adaptation to extreme environments. We worked with different media and conditions that resemble the natural growth condition of Haloferax volcanii, an archaea that is adapted to live in high concentrations of salt (10 times more than regular salt water!). We used different culturing and growing techniques including plating and streaking in solid plates media, inoculating in liquid media, and inoculation in motility plates. We compared the growth of Haloferax volcanii and Escherichia coli, which lives in regular condition, when grown on the appropriate media and on each other's media. 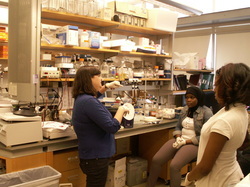 Our main goal was to show the importance of studying life at a molecular level, focusing on proteins. We showed how studying proteins can be fun since proteins can have different colors depending on the cofactors that they harbor which are necessary for their function. In the lab we purified a single protein (cytochrome c) from a mixture of different ones by using its particular biochemical properties. This protein carries a cofactor called heme, found also in hemoglobin (the protein that gives the red color to the blood while it transports oxygen to all the cells). This red protein was successfully separated from other yellow proteins that harbor different cofactors. We characterized biochemically the purified protein regarding its molecular weight (by gel electrophoresis) and its cofactor composition by visible spectroscopy. We found that the red color of cytochrome c is due to the fact that the heme cofactor absorbs different frequencies of the visible spectrum of light (blue, green and yellow) while reflecting the red frequencies.